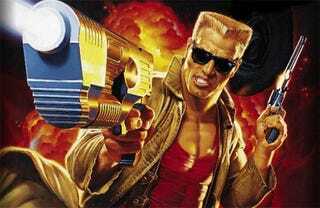 The Week In Review: Duke Nukem Finally? The rumor that Duke Nukem Forever might arrive at long last raises an interesting question. What thrills us more, the game's release, or the thought of it? This week, rumor involving people serious about publishing games, and with a serious record of bringing good ones to market, once again revives Duke's credibility. Take-Two Interactive retains the publishing rights to the franchise, whose brand name remains compelling despite 12 years of broken promises. And Gearbox, fresh off its smash hit Borderlands, published by Take-Two, is said to have picked up the game's development. Gearbox chief Randy Pitchford declined comment but said more news might be coming at this year's Penny Arcade Expo in September. The question remains: This is a name with the star power of Halo or Call of Duty, and just one incarnation as a first-person shooter. And in more than 14 years since its release, that genre has developed and deepened dramatically, and themes of grandiose violence and smirking humor are nowhere near as engaging today as then. Why does Duke Nukem Forever remain compelling? Why should it? Could any game under that name possibly justify the waiting? Splinter Cell's Strange Baby Seal Saving Mission Exposed?